Today Zoe went to kinder for the first time. It was an orientation session, so I stayed there with her, we played with toys and met her new teachers and class mates. She had fun. Inside I was an emotional mess. The realisation that my baby girl was all grown up hit me full force. I managed to keep it together at kinder but when I got home, I was so overcome with emotion. So we had a tea party. To cheer me up and to celebrate this milestone. 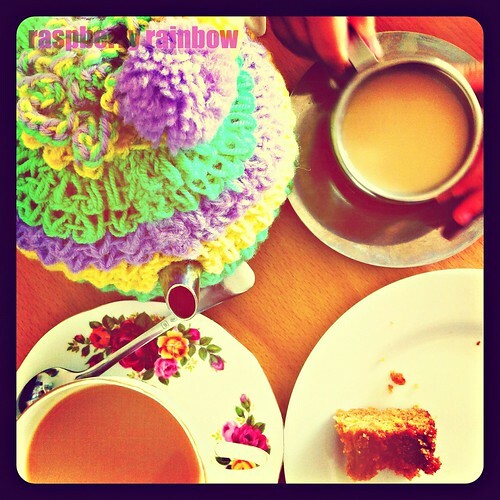 We drank tea and ate apple cake together (I was so glad I made that yesterday!) We talked about her morning at kinder and how much fun she will have there and all the new friends she will make. I gave her lots of cuddles. She gave me comfort when I had a cry. She patted me on my shoulder and very seriously told me it will be ok and that she loves me. That only made me cry more, but it did make me smile too. My baby girl is growing up but that is OK.
How does time go so fast, yet so slow at the same time? Only 3 years ago today, I was 36 weeks pregnant, awaiting Zoe's birth. Now she is a big kinder girl. I am so proud of you, my darling girl. I hope you have a great, less emotional day, than me. Hi Cat, I'd hoped that you'd surface again after the summer holidays, glad to see you back. Time marches on doesn't it..at least you got to have a great tea party after school, and I suspect there will be time for many more. I cried the first day my youngest went to three year old kinder too if that is any consolation. Time just flies so quickly!! She'll have a wonderful time though and so will you!